As you may have seen in my Instagram photos, I’m spending this week in Ballina. I’m attempting to start a novel, set here, in this town of my childhood summers. I’m revisiting memories of hanging at the beach with cousins and being spoilt by my Nan with cooked breakfasts, luxurious afternoon teas and early morning cartoon shows (something Wagga severely lacked). The cousins, from Brisbane back then, are now spread much further afield and my 101-year-old Nan lives in Wagga with my parents. In 1991, I was introduced by a work colleague to my now husband, John. A couple of weeks later I met one of his best mates from school, Mike, who had organised a ski-trip to Falls Creek. Mike travelled in one car, while John and I drove Mike’s future wife and two of her friends in the other. It was the first of many social gatherings we would enjoy with this warm, kind, fun and funny group of friends. We met rather regularly in our twenties. Then there were marriages for some, babies were born, and families took precedence over friends, and seeing each other became rare. I threw a large 50th Birthday Party for my husband in January. The older crowd left before 10pm and the bulk of the rest by 11pm. After seeing them off, I returned to the party outside and found the last remaining guests were from that friendship group. I poured myself a red and settled in for the next hour or two, immensely satisfied to finish the party with these friends. It was so fitting, so right. Perfect. It was the last time any of us saw Mike. He died last week after four years of war with cancer. It started with prostate cancer but a month ago it suddenly turned extra aggressive, attacking his lungs and brain too. We received texts during this month, informing us of this rapid decline, but still, such a shock when the end came. The funeral was scheduled for the middle of my Ballina week but I just had to go. Although we may not see each other much, we are a bunch of friends who are loyal and true to each other. I booked a flight from Ballina to Sydney, due to arrive an hour before the funeral but, of course, it was half an hour late. I ran through the terminal. Being an avid organiser, a trait I shared with Mike, I had booked a car and driver in case the taxi queue was long. The traffic was kind and my driver astute, so it only took 25 minutes from the airport to the crematorium. I was just 2 minutes late. After the funeral, our group gathered again at our house, Mike no longer with us, and his wife home with her family. 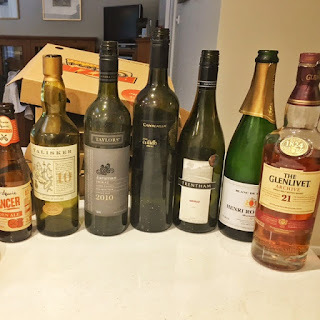 We drank Scotch and red wine, to celebrate and honour Mike’s life, and because, well, bloody oath, we needed it. Mike is the first of our close friends to die. We vowed to see each other more regularly. We don’t want another funeral to be the next time we’re together. I was only in Sydney for 24 hours and I’m typing this, back in Ballina, shedding more tears over Mike as I write. I’m incredibly glad that I followed my instinct by interrupting this week away. It was a special time to say farewell and meet again with friends I’ve had for 26 years. If you have a glass in your hand, or nearby, raise it to friendship and to Mike, a great bloke who has left life too soon.